As you know i made a thread of my old car i was building but once i found this i couldn't resist and wanted it. So as you guys can see i sold my White calais turbo for this. Pretty good actually the car has a lot more on it then the car was advertised with so i am happy with that. It drives so day but is a lag monster with the Gt42r on it but once on song it hums along good but the car was advertised with 600rwhp but me personally i don't think it has that much atm i think it was just a happy dyno i think. The body of the car needs a lot of TLC especially the holds on the car. The interior is in great nick just needs a tidy up and some bits and pieces, I will get a list of things i need for the car and if people have anything that can help or want to sell it would be greatly appreciated. So anyways as for the the drive line i have a lot of parts i am going to fit, and then screw the boost up in her. I will keep you guys posted with everything i do and once the car is tuned. Wow, that's different. That intercooler is massive! What are the engine and drive line specs / details? Looking good. Bring it on! cheers guys, im looking forward to getting to the dyno and then the track once i fix up some things on the car. Looks like a real nugget. Needs a gun rack and a roo bar in my opinion. does anyone know any good cheap spray painters in the western sydney area? want to get some prices.. I'm pretty sure it had hks 272 cams 11mm lift, hks heavy duty valve spring in it. Going from what the original owner that built the car claims. after taking off the cam covers tonight the cams are HKS cams, i will leave them in then. I get ALL my car related work done @ concord customs. Car is there atm getting rear end fixed and sprayed. 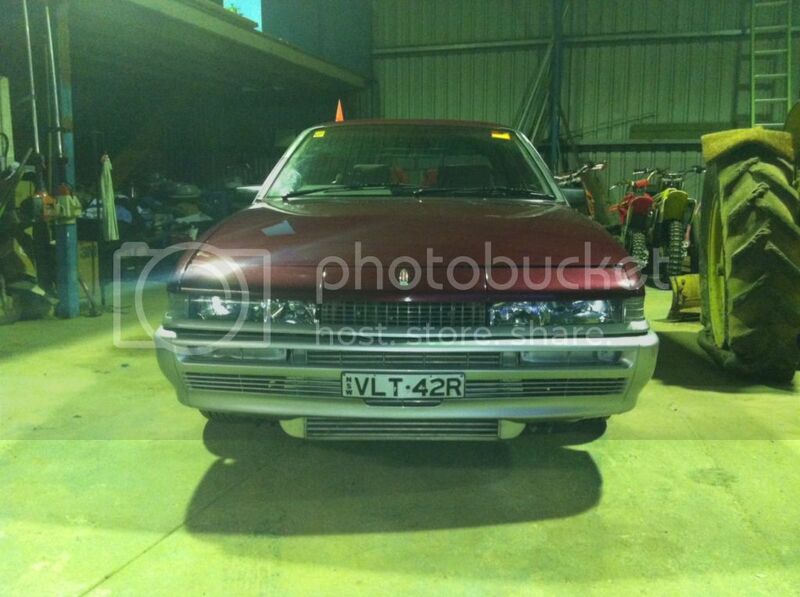 You've got a VL, in Sydney, that you need resprayed and you're not taking it to 2SUS? well to be honest i have never dealt with them before, but will call them tomorrow. I am not trying to spend the world i just want to tidy it up, and make it run some good numbers. Trying to get the fuel gear done in the next 2 weeks and get it off to get tuned. Going to be putting 30psi and E85 in it then see how she goes. Does anyone have a grey auto shifter surround? a good friend of mine owned this, he put the auto in it and cleaned the bay up. goes alright was abit of a sleeper. good buy! yeah its not to bad still not a 408ci turbo like i want, needs a big tidy up though.... Also needs a decent tune in it. Last edited by grunter01; 03-08-12 at 19:26. What kind of power you expecting with 30 psi and E85? About 300Hp I would guess. im trying to keep up with your magna, i might need a shot of gas to get that power. yeah, tune still from when it had the manual... still frys the tyres at 150km/h tho? All times are GMT +10. The time now is 12:19.